We sit in one of the few secluded properties in Ericeira. Right next to it, the community garden and a picnic park give it a feel of being surrounded by nature and sea, within minutes you can reach different beaches or pop down the town center. And you just need to go down the road to find a pharmacy, supermarket or restaurant. 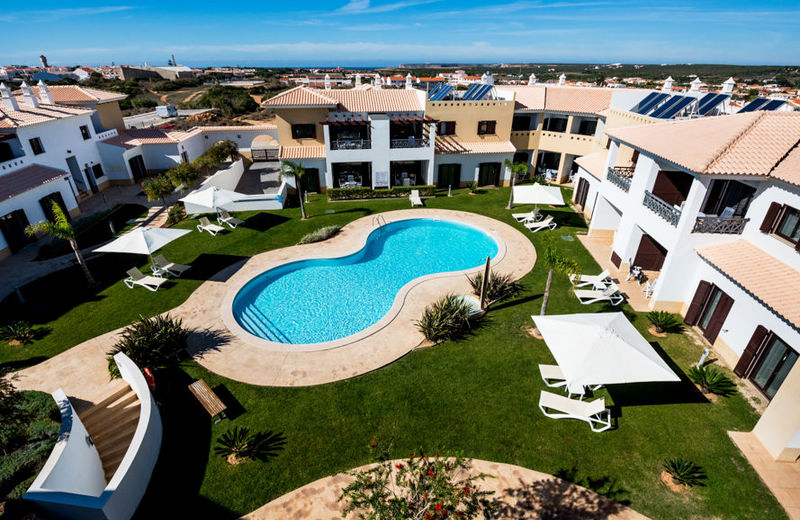 The camp is based in a converted traditional Portuguese house with spacious common areas, sundecks, chill out spots and balconies. We offer dorms up to 5 people, double and twin rooms in the main house, and two bungalows – with private bathroom, kitchen and lounge. You’re also welcome to use the common kitchen, barbeque and TV lounge at any time; as well as our chill out areas, sun decks and terraces. 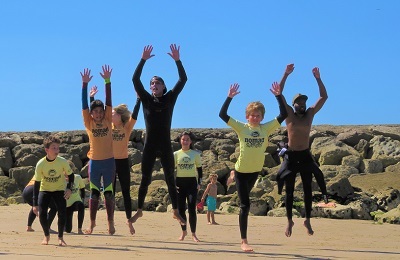 Besides Sun, sea and awesome surf lessons there’s plenty more to enjoy, yoga sessions, aerial yoga lessons, horse riding, SUP, wine tasting, Trips to S|intra, Obidos or Lisbon & if music, surf or major events are happening around us we sure make our way there. We genuinely get a buzz out of making people happy. And when six in ten guests mention their stay as one of the best holidays ever – and at least two come back – we know we’re on the right path. Since our opening in 2013, we’ve consistently achieved outstanding traveler reviews. We’ve been continuously awarded the Trip Advisor’s Certificate of Excellence for providing our guests with an exceptional experience. We host people from all over the world, mainly between 20 & 35, but we have hosted young toddlers and over 70 years young. We can host between 24 to 27 people, being the months of July, August and September the busiest ones, if you are looking for a quieter experience June and October are the months for you. During the season (April/May until end of October) we work mainly with packages that can be just Surf Standard and Premium, Surf & Yoga, Surf & Aerial Yoga and Surf & SUP, all with options from 7 or 14 nights stay. 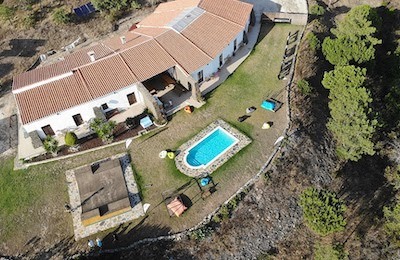 All packages include the activities mentioned, accommodation (with bed linen and beach & bath towels), Breakfast (Continental), Tea & Coffee available all day and the use of the Surf Camp Facilities, some packages include Airport transfers from and to Lisbon Airport, but you can also book them separately. On Wednesday nights we host a BBQ (included in some packages but you can book on the day as well) that is also a great night of fun, food, games and a few drinks after the team will take you to the centre of the town for some fun, dance until you drop. There is a supermarket just across the street where you can shop, but there are others through the town including a fish market. On Wednesdays, we do our BBQ, grilled meat, salads, baked vegetables, crisps, roasted potatoes, a lot of food to celebrate the week and of course Sangria & Beer to toast to new and old friends. It’s a great night that usually ends in drinking games like beer pong and it spreads into the night as we hit the bars in town to add some more fun and dance until you drop. And when it comes the time to drop you can choose one of the following Rooms where we tributed some influencers of the surfing community. Double Room 1 – Our tribute to the last Crown Princess of Hawaii, who fought to give surf culture back to its people. One of the couple’s favorites, with a comfy double bed, private lockers and a porch to the garden. The bathroom is located just outside, shared with two other rooms. Triple Room – This room celebrates Marge Calhoun, the first female world champion and her daughters Robin & Candy who became surfing icons. It has one comfy bunk, plus a single bed and three private lockers. The bathroom is located just outside, shared with two other rooms. Twin Room – Our tribute to Margo Oberg, the first female professional surfer and a giant among men. Room for two, with one comfy bunk, individual lockers and a private backdoor. The bathroom is located just outside, shared with two other rooms. Double Room 2 – Our tribute to Kathy Kohner who inspired the character “Gidget”, a surfing icon for all teens in the 50’s. It is the most secluded room in the house, with a double bed and private lockers. The bathroom is located just outside, shared with one other room. 5 People Shared Room – Our tribute room to Kelly Slater, a living legend and the most successful athlete in Surf history, ever. Room for five, with two comfy bunks plus a single bed, and a private locker per each guest. Two bathrooms are located just outside, shared with one other room. 5 People Shared Room – Our tribute to Sean Collins, the father of surf forecasting who has changed all wave-riders’ life forever. Room for five, with two comfy bunks plus a single bed, private lockers and a private veranda. Two bathrooms are located just outside, shared with two other rooms. Double Room – Our tribute to Gerry Lopez, the surfer who meditates on waves and the best tube rider in the world. This is the largest room for two, with a comfy double bed and private lockers. Two bathrooms are located just outside, shared with two other rooms. Twin Room – Our tribute to John Florence, one of the most dominant Pipe surfers of his era and said to be the next Slater. A room for two, with one comfy bunk, storage, private lockers and your own recital of nesting birds in the morning. Two bathrooms are located outside, shared with two other rooms. Double Room – The king of all rooms, and a tribute to Duke Kahanamoku. A Hawaiian legend, and the father of modern surfing. This bungalow for two has a couple’s bedroom, a private bathroom, a kitchen, eating area, and an extra room to relax. It is also a favourite for families, who can request a set up for an additional bed. Double Room – Another king of rooms, and a tribute to Jack O’Neil. A Hawaiian legend, credited with the invention of the wetsuit, and the founder of one of the main surf brands in the world the O’Neill brand. This bungalow for two has a couple’s bedroom, a private bathroom, a kitchen, eating area, and an extra room to relax. It is also a favourite for families, who can request a set up for an additional bed. Surf Lessons are a must, our team of professional instructors wants you to make the most out of this time with them. So if you never tried surfing before or you have and want to take your surf skills to the next level they are here for you. Lessons are 2 hours long and considering the package you bought you can have from 4 to 5 lessons in a week or 8 to 10 lessons spread in two weeks. We keep the rations between students per instructor at a max of 1 to 5 to guarantee more time in the water & immediate feedback. Surf experience is not required and our instructors can teach from complete beginners (first timers) to advanced surfers. During beginners lessons, the water level will be maximum to your waist though water confidence and basic swimming skills are required. In case of families, we always try to teach them together and in case of underage kids a parent/guardian will have to be at the beach either enrolling on the lesson or on the sand at all times. For toddlers not old enough to be part of the experience and in case both parents want to be part it is their responsibility to hire child care, we can help you find one but ultimately it is the parents’ responsibility to organize it. During check-in, you will be requested an ID and to sign a form acknowledging the experience you are enrolling. Surfing is a fun activity and in most cases, life-changing once you stand up on the board for the first time, but it also carries some degree of risk, listening and following the instructor’s guidelines is crucial not only for your improvement as a surfer but and for most for your and other surfers safety. Our instructors are stoked to share a bit of the silver coast experience with you. Apart from their personal experience all over the world, they have thousands of sea-hours, in class, with all learning levels. 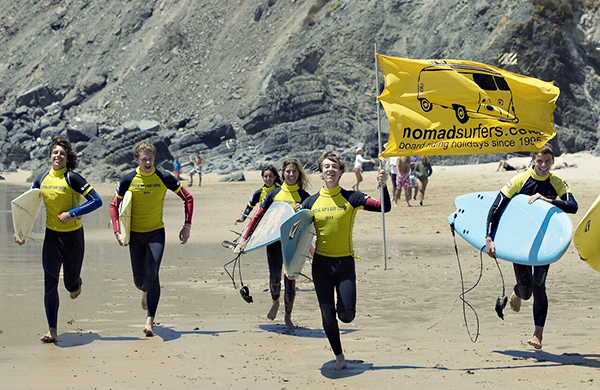 Most importantly, they are credited by the International Surf Association (L2) and the Portuguese Surf Federation. We always aim to teach on non-reef breaks to avoid the cuts and bruises and to allow you more fun, for that we travel along the coast, the closest beach to us with those conditions is a 15-minute drive but if conditions aren’t the best we will travel along the coast to find the best option possible guaranteeing fun, quality but most of all safety. Ericeira is the only World Surf Reserve in Europe, and one of the most consistent spots on the South Atlantic coast. We have such variety of waves, beaches, reef and point break, that you’ll find perfect spots, regardless of your experience. But we are talking Atlantic so expect the temperatures to be around 15º to 17º degrees (you might feel it cold as the temperature outside between June and November is usually over 20º), a 4/3 neoprene suit will be provided for the lesson but of course if you have your own you can bring it as well. We are lucky enough to be in Ericeira. It is a small town, but full of life. Especially in the sunny seasons, when days and nights are warm and long-lasting. The center is bubbling with people, street fairs, lovely shops and a great variety of bistros, cafes, and terraces. The evening starts slow, with plenty of restaurants serving dinner until late, pubs, bars, folk parties and even a Club open until 6 am in the Summer. To explore the town you don’t need a car, at a walking distance you have the center with shops, pharmacies, cafes, restaurants, bars, supermarkets, market, surf shops, beaches, skatepark, the night club, theWorld Surf Reserve Museum and you can do it all at the flavor of one of the best ice creams you ever tasted. The town is an amazing place to walk and explore the quirky roads and the little corners, but most special of all the sunsets, and for that all you have to do is choose your spot in one of the many coast viewpoints, beaches, cliffs or even at the surf camp. There are also public transports that connect Ericeira to main areas around, like Lisbon, Sintra, and Mafra, but if you decide to rent a car or even bring your own the coast both north and south of Ericeira is worth exploring. Lisbon is 40 Km away, Sintra (a UNESCO Heritage Site and very Turistic) is 35 Km, Nazaré where the world record of Biggest Wave is only 117 Km (1 hour away). 1. Arriving at Lisbon Airport, get the underground (METRO) and exit at CAMPO GRANDE station. 2. As you exit the METRO building, you can find a bus terminal where you have a connection to Ericeira. 3. If you exit on the Bus Terminal you will have to turn left (uphill), pass the Fireman Station and once you see a big Supermarket (CONTINENTE) we are opposite. 1. Arriving at PORTO Airport, get the underground (METRO) and exit at CAMPANHÃ station. 2. The train station has trains to Lisbon, your destination choice should be LISBOA-ORIENTE. 3. Arriving at Lisbon, get the underground (METRO) and exit at CAMPO GRANDE station. 4. As you exit the METRO building, you can find a bus terminal where you have a connection to Ericeira. 5. If you exit on the Bus Terminal you will have to turn left (uphill), pass the Fireman Station and once you see a big Supermarket (CONTINENTE) we are opposite. 1. Arriving at FARO Airport, get a BUS to the city center / Faro train Station.